Buying a tankless water heater is a great way to save energy and reduce your monthly electric bills while supplying your home with an endless source of hot water at the same time. With so many different choices available, it is hard to decide which one to choose. If you’re looking for an affordable, high-performance unit, you should consider the EcoSmart Eco 11 tankless water heater. The Eco 11 is an electric water heating unit, meaning that it doesn’t require any burners or flames, unlike the gas units. And, since it doesn’t require a ventilation system, the installation is very simple and inexpensive as well. In addition, thanks to its compact size, you can place Eco 11 almost anywhere inside your home. Who is the EcoSmart Eco 11 tankless water heater built for? Moderate climates with incoming water temperature above 67 °F. If the Eco 11 water heater doesn’t seem like a fit for you because of these reasons, we recommend you check out the Navien NPE-240a or one of these Rheem tankless water heaters. The EcoSmart Eco 11 can heat up water to 105 °F nearly instantly. As soon as the water reaches this temperature, the heater will provide hot water to several pipes. This water heating system comes with a digital temperature control which allows the user to change the temperature in one-degree increments on the water heater itself. All the controls of the heater are designed to provide the user maximum control over the unit and assure consistency in producing hot water. 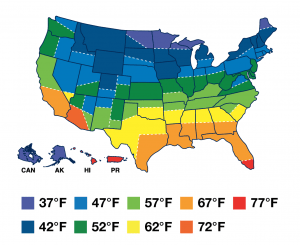 However, when the incoming water temperature is below 67 °F, the tankless water heater’s performance will be impacted. This could lead to a lower maximum water temperature or a reduced flow rate of hot water. You can check the map below to see what the incoming water temperatures are in your area. This map shows the average incoming water temperatures across the USA. Courtesy of EcoSmart. If you are looking for a way to cut your monthly expenses, your electricity bill is a great starting point. Depending on where you live and what energy costs are like, you could save hundreds of dollars per year by using a tankless water heater. According to the manufacturer, the Eco 11 water heater can save up to 60% on your energy bills. The EcoSmart Eco 11 works in a very efficient manner. It doesn’t have a standby time and it will turn on only when a pipe goes on. As soon as the pipe goes off, so will the heater. To install this water heater all you need is a 60 amp power supply and a #6 copper gauge wire.The unit comes with an automatic and resettable thermostat. The water heater sets the initial temperature automatically, making this water heater very easy to use. Many homeowners have installed this water heater themselves, but one word of caution: if you install this tankless water heater yourself, you might not be eligible for EcoSmart’s product warranty. Because of this, we recommend using a professional to install the water heater. You can find a licensed plumber on Amazon’s home services marketplace, which makes it easy to purchase the appliance online and make sure it’s installed properly. Since we already mentioned the warranty, it is good to know that the manufacturer offers a lifetime warranty for all EcoSmart tankless water heaters that are used for residential purposes and installed by a licensed professional. The warranty covers the electronics, element, and heat exchanger on the water heater. Keep in mind that you should refer to the owner’s manual to see more details regarding the warranty and what it covers. All of the components are made out of copper or stainless steel to ensure durability. The compact size minimizes the amount of space heater takes up. It uses technology that controls the unit’s energy output for optimal performance. The heater can be used for single or multiple applications. The unit can heat up to 2 gallons of water per minute. The “point of use” design of this water heater is not ideal in all circumstances. The unit must be installed with a restrictor. In order for the lifetime warranty to be valid, the heater must be installed by a professional. This term means that the water is heated near the fixture where the hot water is delivered. This means the water heater is close to the sink, bath, or shower where the water is used and not in a central heater. In some cases, homeowners could replace a single centralized water heater with multiple point of use water heaters like the EcoSmart Eco 11. Can EcoSmart Eco 11 be used in a large home? 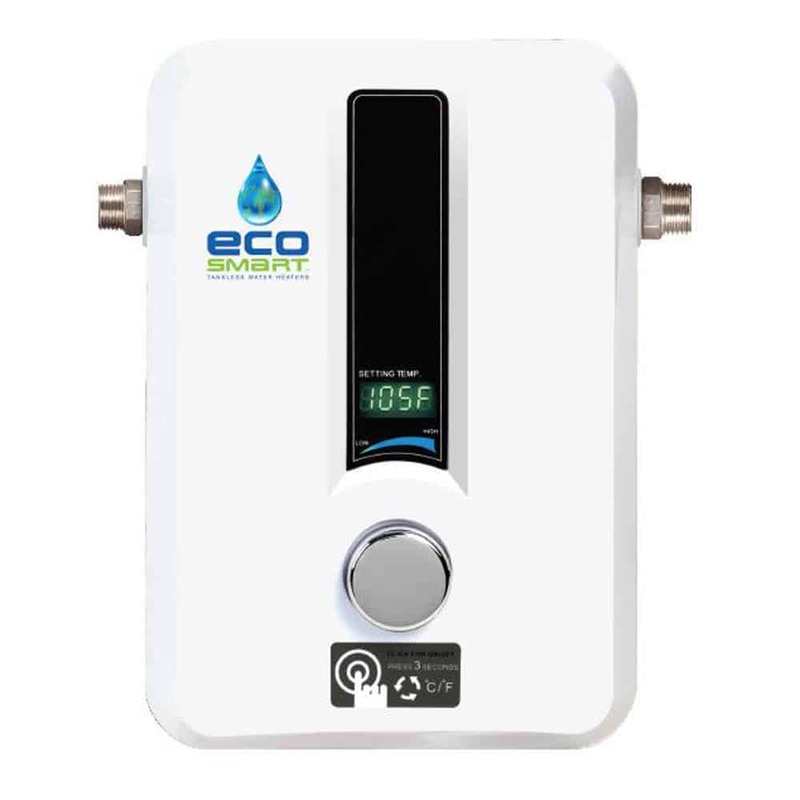 With a flow rate of 2.3 gallons per minute, the EcoSmart Eco 11 is ideal for smaller homes and apartments. Another option is to use multiple EcoSmart Eco 11 heaters throughout a larger home and embrace a point of use water heater method. Should I buy the EcoSmart Eco 11 tankless water heater? It is a great choice for those in need of an affordable tankless water heater. The manufacturer is a trusted name in the industry, this unit is considered as a premium heater. The Eco 11 is lightweight and compact, making it very easy to install the unit just about anywhere, it’s perfect for a point of use system or for smaller homes. The heater uses advanced technology to provide constant hot water supply while reducing energy consumption at the same time. If this heater meets your needs based on your home size, and you live in an area with the right incoming water temperature, we think the EcoSmart Eco 11 is a great value! If you’re not sure, we recommend you check out the Navien NPE-240a or one of these Rheem tankless water heaters as a point of comparison before making your purchase.